A RolePlaying group based on the L4MS DeviantArt group. APPEARANCE: He has a long and abnormal muscular arms that are probably bigger than he is. His eyes are blind and dead white with no life whatsoever. He fashions a normal attire that turns into a punk ripped clothing because... well... because of his gigantic arms. Jabez has a bad habit of sticking his tongue out like most Tanks, but he sticks it upward, sticking it to his left or right cheek. Although he is very insecure about his little man appearance, Jabez usually makes it up by showing his enormous arms to put up a front. PERSONALITY: He is an exaggerated and overreacting gamer who gets too involved with his PSP and would practically marry it if he can. He is also insecure about his appearance which results to his fits here and there. Jabez is also a loud-mouth who only cares about games, games, and more games! He is reckless, problematic, and is your typical annoying 13 year old boy who would make any adult go insane in a matter of minutes! Jabez is a problem child to most adults, but an angel to his older brother Bart. INTERACTION WITH OTHER STUDENTS: Jabez is a fun to be with classmate who everyone can hang out with and have fun with! But if his classmates tease his personality, especially his blindness, he would go... BERSERK. INTERACTION WITH TEACHERS: Because of his addiction to his PSP, he is usually scolded because he plays it in the middle of class. Although he is a problem student, he actually gets good grades! Good enough that his teachers would actually allow him to play his PSP from time to time! HISTORY/BIO: Jabez doesn’t know the fact that his infection was a result of his parents who were obsessed with the Green Flu, and started experimenting on him when he turned 10. 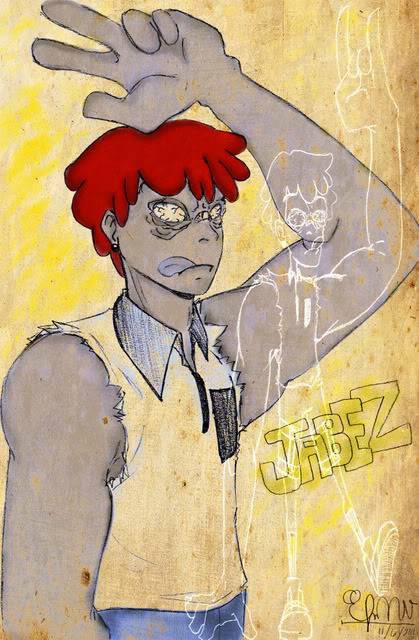 Although unknown as to why he doesn’t remember his parents or the experimentation, or how he turned into a Tank, is a mystery to him, Jabez doesn't really mind. All that matters to him is that he still has a brother who cares about him more than anything in the world that he can no longer see. In addition to his predicament, Jabez's blindness is inevitable and cannot be fixed. But ever since his older brother gave him a PSP on his 13th birthday, he was able to see! Well, not everything... just the games he plays in it. The red-head believes that he can't actually see them, like in reality. But he can imagine the game as if he can actually see it! But what Jabez doesn't know is that he can in fact see the game itself through the PSP that Bart gave him. This was made possible because of his older brother's abnormal abilities, making little red-head Jabez to actually see the games he is playing. FAMILY: His only family is his older brother Bart. Both of his parents are dead, but since he has no memory of them at all, Jabez has no feelings towards them whatsoever. All he really cares about is his big brother Bart, and his PSP! LIKES: He likes two things, his older brother Bart, and his PSP. As for what he eats.... he’ll eat anything that Bart would feed him... whether or not it’s dead or about to be. But like all kids, all Jabez actually LIKES is a good time! DISLIKES: He hates anyone who would point out his blindness. He would immediately turn his insecurities into rage and makes one hell hole out of his surroundings. EXTRA: He never told anyone, even his brother... but he is actually a hopeless romantic. Oh! And he is very strong... since he IS a TANK.... and he cannot control himself at all... because he IS a Tank... and his strength is also his downfall. HIGH SCHOOL INFORMATION(OPTIONAL): His gaming addiction leveled up and is now a gaming obsessed idiot who always has his PSP with him... whenever... wherever. Interesting. But how can he play his PSP if he's blind? I have edited it, please check his BIO, I've put the info there.